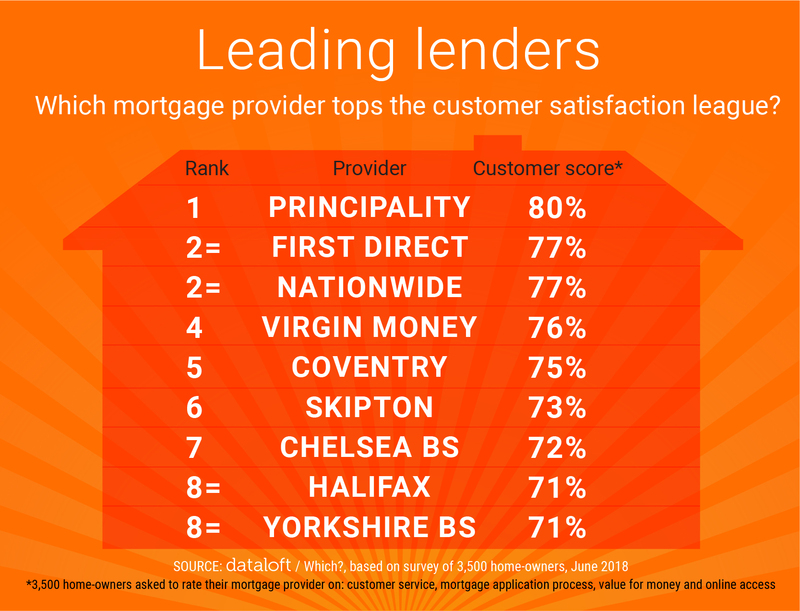 Which mortgage provider tops the customer satisfaction lead? Principality tops the league of UK mortgage lenders for customer satisfaction, according to a new survey from consumer research group Which? with First Direct and Nationwide tied for second place. Which? surveyed 3,500 home-owners asking them to rate their mortgage provider on customer service, the mortgage application process, value for money and online access. Fourteen companies received scores of 70% or above. The top nine are listed here, while Nat West, HSBC, TSB, Santander and the Leeds Building Society all scored 70%. Which? do caveat that the best mortgage lender for any home-owner will depend on individual circumstances. Anyone seeking to take out a new mortgage or re-mortgage their existing property is recommended to seek advice.